My life -- more specifically my life as a writer -- was changed for the better this week. 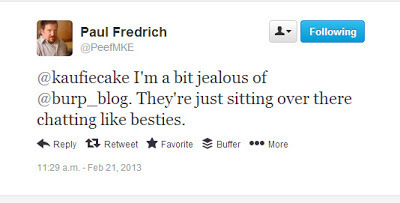 I attribute this phenomenon, in large part, to an opportunity I was granted through my freelancing for OnMilwaukee.com. 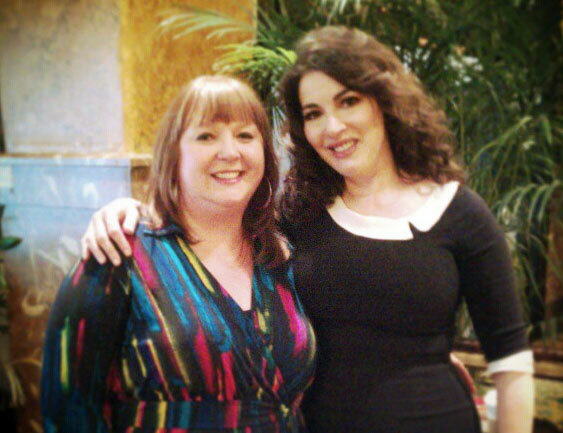 Nigella Lawson made a visit to Milwaukee on Thursday to promote her new book, "Nigellissima." Thanks to a serendipitous email on the part of my editor, I was able to meet with her for a face-to-face interview. Our time together was brief, just longer than half an hour, but within that time I experienced what I can only call an epiphany. I'll confess that I'm not always all that excited about interviewing celebrities, not because they're ever really unpleasant, but moreso because most interviews end up feeling oddly cold -- more like a business transaction than a conversation between two warm-blooded, living human beings. But, my conversation with Nigella was... very different. Yes, I took the obligatory "fan shot" (which, in retrospect, feels a bit cheap and silly). And I did get her to sign a book for me. But, still. There was something quite unique about our interaction. And I can't get it out of my head. Before I delve more deeply into my experience, I should probably explain that I'm very rarely "star struck." I don't know why. I just don't get excited about these sorts of things. Even the knowledge that I would be meeting THE Nigella Lawson "in the flesh" didn't really have what might be described as "the usual" effect on me. Now, that isn't to say I don't have an interest. I've been following Nigella for a good many years. While I missed out on most of her career as a British journalist, I did follow her columns in "Vogue" magazine, as well as her work in "Bon Appetit" and "Gourmet." Ever impressed by her personal connections to food, and her uncanny ability to connect with the reader through her experiences, I was a shoe-in to purchase her very first book, "How to Eat," when it was published in the States. Although I was interviewing her with regard to her newest book, I felt compelled to bring my copy of that first tome with me to our interview. In fact, I introduced the interview with a very sincere thank you to her for writing a book that so clearly communicated her love for food, and which -- more importantly -- did so in such a personal way. While I expected a cordial response to my --possibly sappy-- introduction, what I received was far beyond anything I could have envisioned. "Thank you," she responded with the most heartfelt of smiles. "I put my heart and soul into everything, but this is absolutely everything I believe. This is my first-born and it has a special place in my heart -- also because, in a way, it was an odd book for me to write, having not hitherto been a food writer. And also because -- how strange that I was allowed to write this … that is a work that's not exactly a cookbook, not exactly a piece of food writing, but something in between. I tried to talk about food in my life personally, and where I feel it fits in generally. I find that most people who like reading, and who like food, respond to it. If I’m at a book signing, and people come back and bring that to me, I immediately feel there’s a very strong connection and rapport, because it’s kind of soul to soul." Her response was believable -- not only because she said those words, but because the remainder of our interview had such a personal tone to it. We sat openly in the lobby of the hotel -- quite within view of everyone who happened to take a stroll in or out. 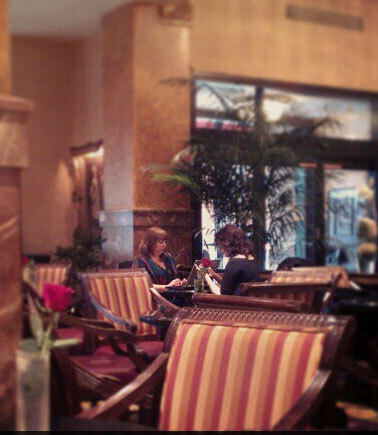 Her demeanor was very much without pretense, and our interactions were far less "professional" than I expected. In fact, our entire interaction felt very much like the reintroduction of two estranged friends, who simply needed a bit of a warm-up to return to their former intimacy. Certainly, she answered my questions. But, she opened herself up to the dialog in a way I've not really seen in most interactions I've had with celebrity. She shared the story of the creation of the book -- which took place in the wake of her late husband's cancer diagnosis. She mused on the relationship of her work to feminism, and her perspectives on the authenticity of ethnic cuisines. She shared some of her favorite cookbooks, including detailed explanations of why she enjoys each one -- and where I could get copies of the most beloved, if I was interested. And, although her schedule was tight, and my interview time had gone over by at least ten minutes, Nigella remained a few moments more to chat with me about a brownie recipe of hers that I've been making and enjoying for quite a few years now. And yet, it wasn't so far from the truth. In fact, when we were done talking, she gave me a great big hug. Was I speechless? Oddly, no. But, was I moved? Absolutely. In fact, I spent the remainder of the day basking in a very surreal feeling -- the sensation, I suppose, of having truly connected with someone whose love for what she is doing far surpasses the notoriety she enjoys in doing it. And that... well, it changed me in a way I could never have envisioned. NOTE: I'll be postinga link the interview over on Facebook when it goes life on Wednesday, February 27th... in case you're interested. I'm so envious. Nigella is one of the people on my imaginary dinner party guest list! This post warrants a response, and not because of the brownies, which I can't eat anyway (it's that annoying gluten thing). I've been a Nigella fan since my daughter went to school in London many years ago. She seems so pleasant and down to earth. Your description of your meeting and interview is exactly as I would imagine. Although I've never met either one of you, you seem similar in my mind. Very likable, approachable, and authentic. I'm not at all surprised you are now "besties" with Nigella. Love your posts. You're definitely an engaging writer! Thank you for a lovely beginning to the week. As someone who worked in the music industry for years & got to meet a lot of "celebrities", I know how refreshing it can be to meet someone who is real and that shares a real personal connection with the people they meet. I'm so glad to hear Nigella was like that, I've always felt she came off as very real on her tv shows. Refreshing is exactly the right word! I enjoyed reading your reflection, very well written! Thanks so much, Karis -- Means a great deal coming from you. It's awesome. All of it. And there's nothing wrong with the "fan shot"...fun! I am so jealous... I have always loved Nigella. Her recipes are always some of the few I never feel the need to tweak - that she cooks as I cook, and her love for butter and dessert always fits in well with my menu planning!